Send us your creative USB ideas to win a latest GIGABYTE USB 3.0 motherboard. GIGABYTE TECHNOLOGY CO., LTD., a leading manufacturer of motherboards and graphics cards announced the GIGABYTE USB 3.0 & 3x USB Power web contest, “INCREASE YOUR SPEED, TRIPLE YOUR POWER”. GIGABYTE has recently introduced two exciting new USB features to a full range of their Intel and AMD motherboard product lineup including USB 3.0 compatibility, which delivers a 10x data transfer boost over USB 2.0, and USB 3X Power Boost, which provides additional power and stability for USB devices such as external storage devices or optical drives. In order to showcase these new technologies, GIGABYTE would like to hear from you how you would best use these technologies. Send us your concepts for USB 3.0 devices or USB devices that can take advantage of a 3x USB Power Boost. Your concepts can include videos, pictures, or just a description of the device. Visitors to the contest website then have the ability to vote for their favorite concepts. In order to help spread the word, contestants have the option to share their creations with their friends via Facebook to help get them the votes they need to win. At the end of the competition, the top three concepts with the most visitor votes will each win a latest GIGABYTE H55M motherboard and an A-DATA NH01 Portable Hard Drive. GIGABYTE will also play judge by awarding entered concepts points based on creativity, originality and design, with the top 3 concepts chosen by them winning a GIGABYTE GA-P55-USB3 motherboard and A-DATA N002 Combo Flash Drive. Visitors who vote for their favorite concepts also have the chance to win. Each time a visitor votes, they will receive one entry into our lucky draw for the chance to win a yet to be released GIGABYTE GA-880GM-USB3 motherboard based on the AMD 880G North Bridge and SB850 South Bridge. Visitors are allowed to vote up to 10 times per day. 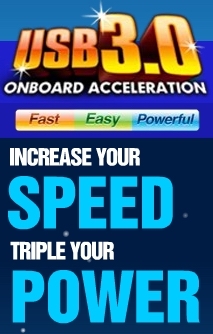 The GIGABYTE INCREASE YOUR SPEED, TRIPLE YOUR POWER web contest ends April 30, 2010. In order to enter the contest, and for complete contest rules, please visit: http://usb3.gigabyte.com.tw/event. Thanks Gigabyte, nice set of prizes here. The website is 100% Flash though, and it's quite slow and cumbersome to use. I've had a look at some of the submissions, but the majority of the them are quite unoriginal like external HDD, external flash drive, etc., these are usb devices that already exist. Anyway, I'll try my hand at the voting for the GA-880GM-USB3 prize as I can't think of a great idea for the competition yet. I am sorry for the double posting ! I did not know the event USB3.0 or USB333 was called "April Web Contest" Here . I think , In All the Gigabyte Contest Gigabyte have made , this Contest was the most interesting of all so fare . There was lots of contestant from many countries . Lots of idea , video and picture . Was fun and refreshing ! More inventive contest like this please !!! My Question was ( and still ) : I am one of the Winner of this contest . A months ago they released the name of the winner voted by visitor. Then a week ago they released the winner names By Gigabyte Judges and lucky draw . Is now a week and Gigabyte USB333 event maker did not yet contact me . What should I do ? Why it take so much time for them in contacting us when they already acknowledged the winner ? Can some one help please !! As far as I remember there was some email mentioned in the event site, please try to find and use it. If still no help then you can send me PM. Thank you for the fast reply !! . The Event site ? Do you mean the USB333 event flash page ? I am afraid this page are gone forever . Could you give me the right URL to this Event site Please ? I have a email address to the USB333 event moderator call Karen . I sent her a email the day I saw my name on the winner board . But since a week i did not get any mail from her . First of all please be patient, anyway you won finally ! You can re-sent your email to Karen, if no reply till next Mon please contact me. Karen Finally answer my mail ! She told me that they all very busy for the Computex exhibition . I give her my home address so all ok ! Isn't it about time we had another contest? I've been waiting for you to put up some new exciting gear for grabs! Yes, I've been thinking about it already. Maybe some small competition will be announced next week. The award will be some recently became famous IT device marked with the sign of fruit but the requirement will not be so easy to fulfill this time of course. I really can't imagine what the prize would be, runn3R! obviously an Apricot machine real old skool !